Maybe I should call today's post Deep End Cooking (with apolgies to Deep End Dining) or Mage, Don't Make It! (wih a nod to Steve). At least I can be thematic with all the Halloween horrors out there. the Columbia River sturgeon caviar at the Herbfarm—I wasn't sufficiently bowled over to pay the rather steep price. 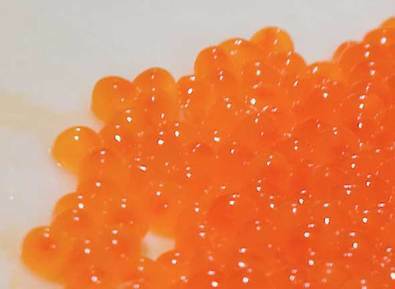 So when a friend dropped by the other day with a fresh salmon and several skein of salmon eggs and asked if I wanted to make caviar I thought, "Ummm, errr, sure...?" Luckily for me, he also brought the simplest recipe I could imagine for this, calling for a short brining and a couple of rinses. Even better, it says the caviar keeps for several months. This is a very good thing...if for no other reason than that, by the time I was done making it, I really couldn't think of eating it right away. 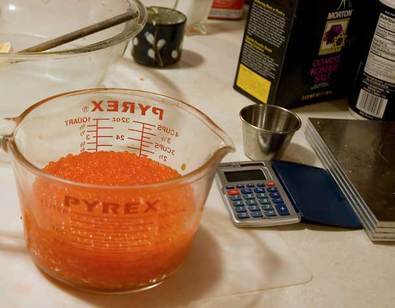 You see, making roe into caviar is simple, but cleaning the eggs, not so much. Here are a few skeins of salmon eggs—fresh from the beast as it were. The eggs are enclosed in a substantial outer membrane as well as having a more tissue-like inner structure that holds the individual eggs together. Note that substantial doesn't mean "tough enough to pull off easily"—that would be asking for altogether too much. It simply means it's tough enough that in a tug-of-war, the eggs are what breaks first. While searching for tips on doing this—of which there are surprisingly few online—I stumbled across a thread on eGullet that described a method of cleaning the eggs that didn't involve hand-picking through 3 egg skeins. Basically, you cover the eggs with hot water (which toughens the membrane and makes it semi-opaque, which really doesn't help), poke and agitate with a chopstick to loosen the eggs from the membrane and then swirl the chopsticks around the bowl in a circle, which entangles the membrane around so it can be removed. I'd have pictures, but during this part, I was just gritting my teeth and trying to get it done. There are moments when the word placental is all that comes to mind. 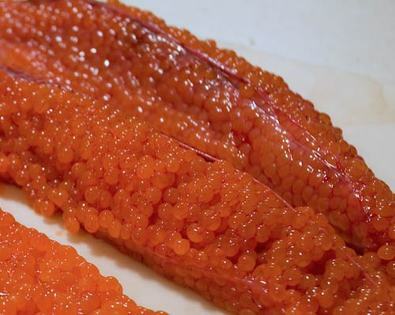 Should you find yourself in possession of a skein of salmon roe—and a strong stomach—here's how you make it into caviar. 1. Clean eggs by method described above. Do this part quickly to minimize the time the roe spends in the hot water. Drain, then place in refrigerator for 15 minutes to chill. 2. Measure roe and prepare brine. For each cup of eggs, mix 1 cup cold water and 1/4 cup salt. I used kosher salt which, as you might be able to tell from the picture, required converting from table salt by weight. Stir this periodically to dissolve the salt as you complete the next step. 3. Spread roe on flat surface and finish picking out bits of squished eggs or membrane. 5. Rinse quickly, drain again, store in tightly closed containers in refrigerator. I'd tell you what this tastes like, but I still haven't made it past that whole placental/membrane thing.